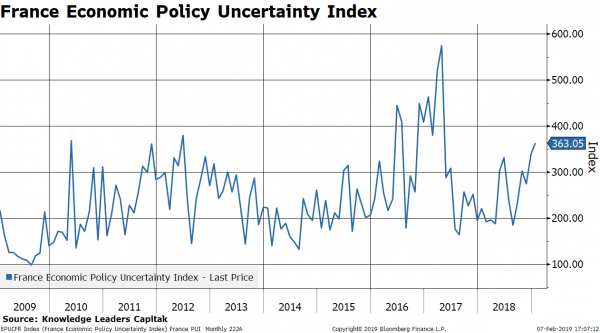 The concept of a separation between risk and uncertainty is an important one right now given how severely politics are driving markets. Maybe for another analyst, politics is a measurable field and subject to probabilistic analysis. For me, it is just pure uncertainty. But, this uncertainty is driving the market, so I have to at least attempt to measure it and identify relevant relationships. 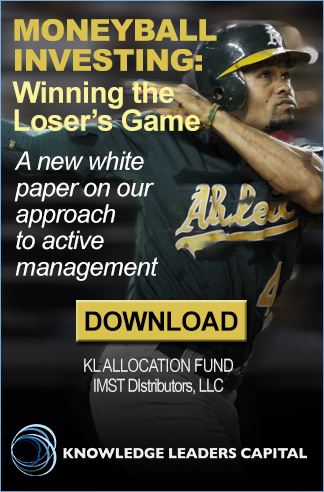 The one area where there seems to be some interesting relationship is in the currency markets. 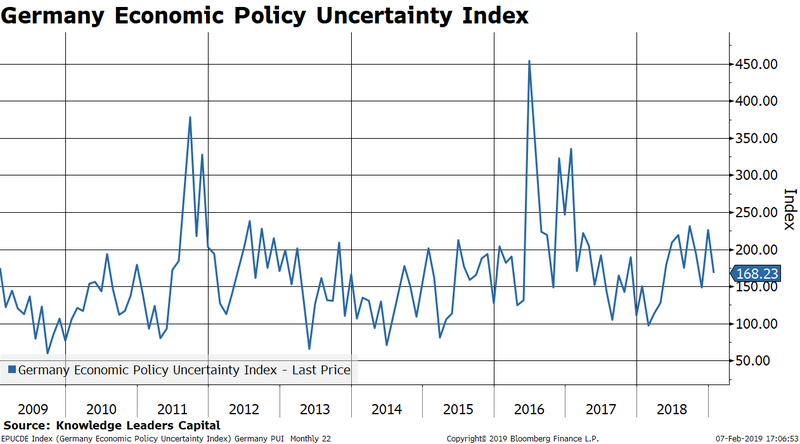 In the chart below, I illustrate how greater global uncertainty is associated with a stronger USD. 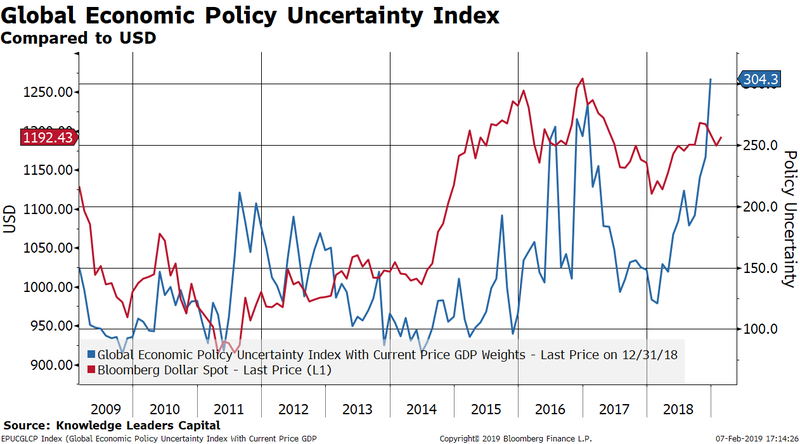 If one is looking for another surge higher in the USD, this chart provides the ammunition as global economic policy uncertainty is breaking out to new highs. 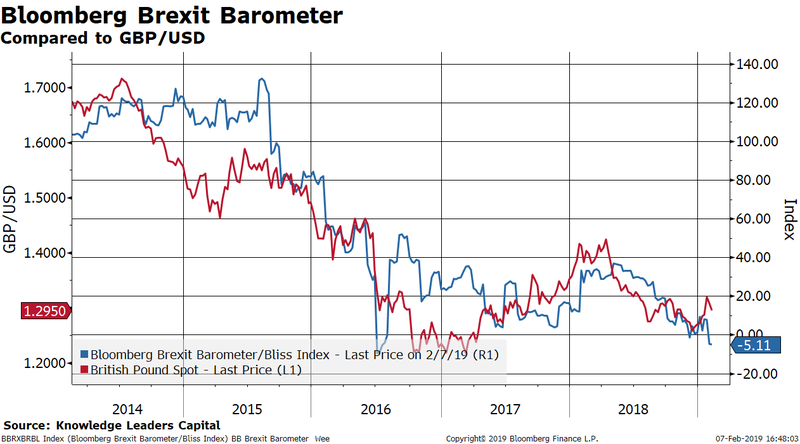 Turning to Europe, there is a really strong relationship between the Bloomberg Brexit Barometer and the GBP/USD cross. 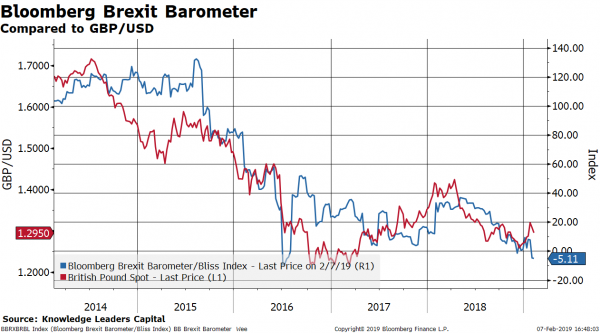 If the odds of Brexit continue to rise, history would suggest a weaker GBP is likely. Continental Europe is an interesting study. 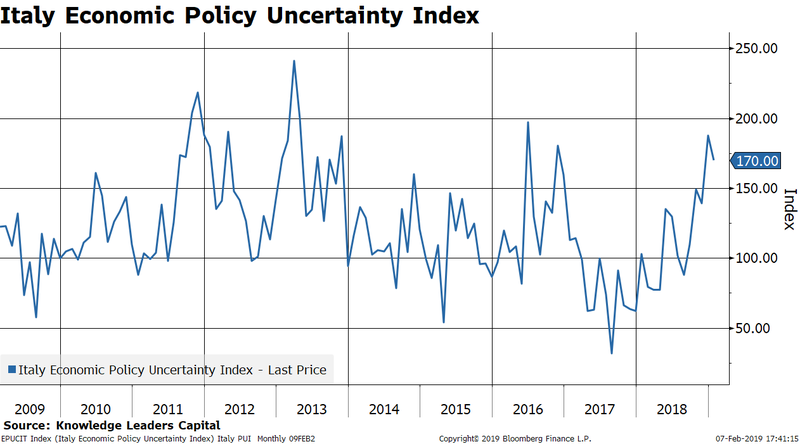 In total, policy uncertainty is receding modestly which suggests a possibly bullish backdrop for the Euro. Policy uncertainty has fallen pretty significantly since the migrant crisis in 2016 and has stayed fairly contained. 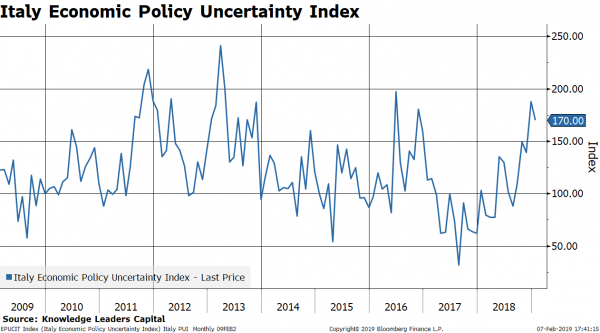 France, on the other hand, is seeing a spike in policy uncertainty as the “yellow vest” riots continue. 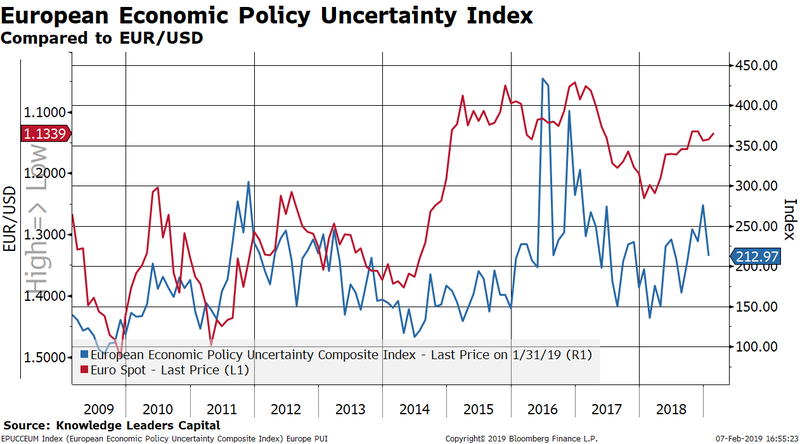 Italy, with its plans for an aggressive fiscal policy, has seen its policy uncertainty rise pretty significantly lately, helping explain the weakness in Italian bonds. France recalling its ambassador yesterday probably won’t help either country’s policy uncertainty. The real action has been in Asia recently, particularly China. 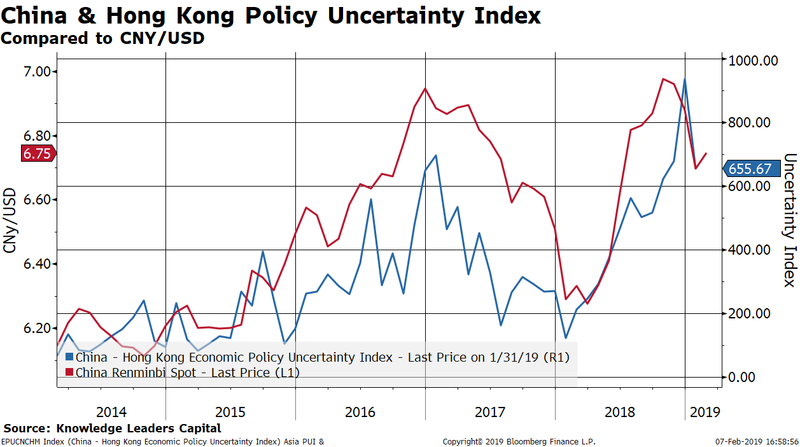 Rises and falls in China’s economic policy uncertainty are highly correlated to movements in the CNY/USD. 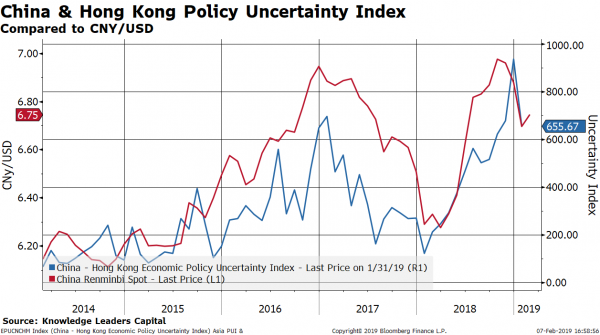 Any ratcheting up of trade tensions, sending policy uncertainty higher would likely send the CNY past the critical threshold of 7. 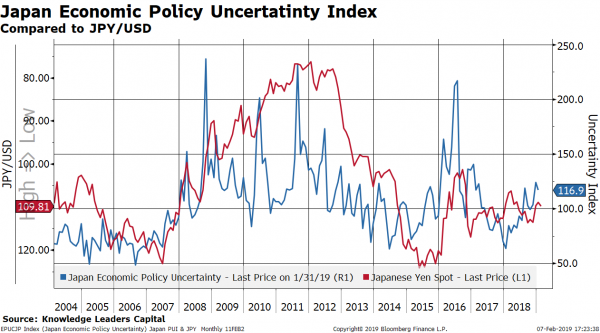 Japan is an interesting example to study because unlike every other country, its currency tends to rise during periods of elevated policy uncertainty. 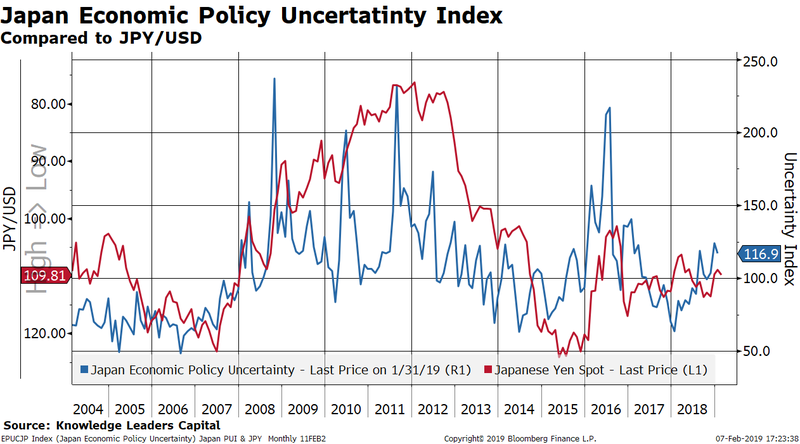 So, a fairly tranquil Japan right now (with Abe on track to be the third longest-serving Japanese PM ever by June 7, 2019) is actually a head-wind for Yen appreciation it would appear. Yen bulls should hope for some fireworks in Japanese politics. 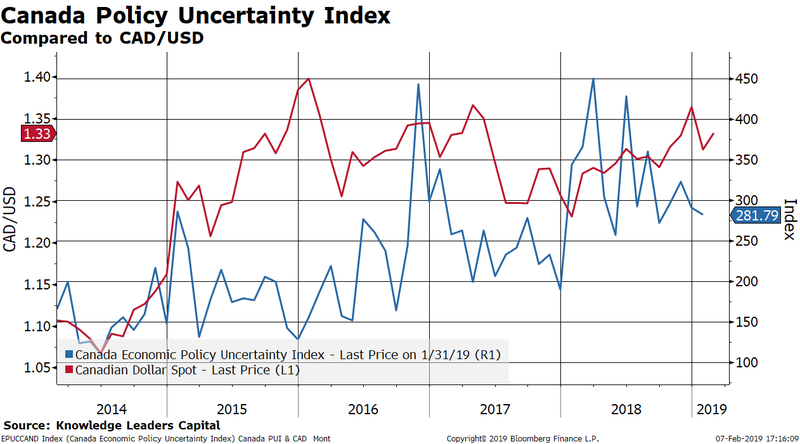 Policy uncertainty in Canada seems to be receding now that NAFTA 2.0 has been outlined, offering a potential bullish scenario for the CAD. Brazil stands out as the country where the drop in policy uncertainty doesn’t seem to be reflected in the currency value. 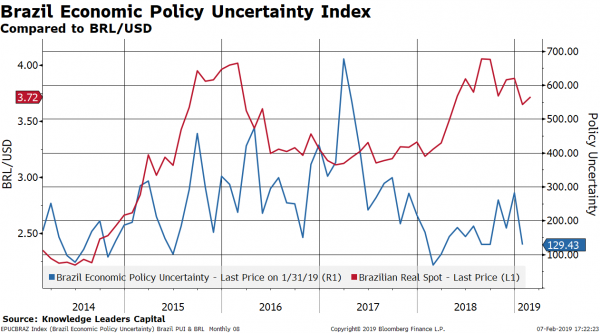 If policy uncertainty remains low, the BRL could be a real winner. The USD has moved in lock-step with President Trump’s approval rating since his inauguration. 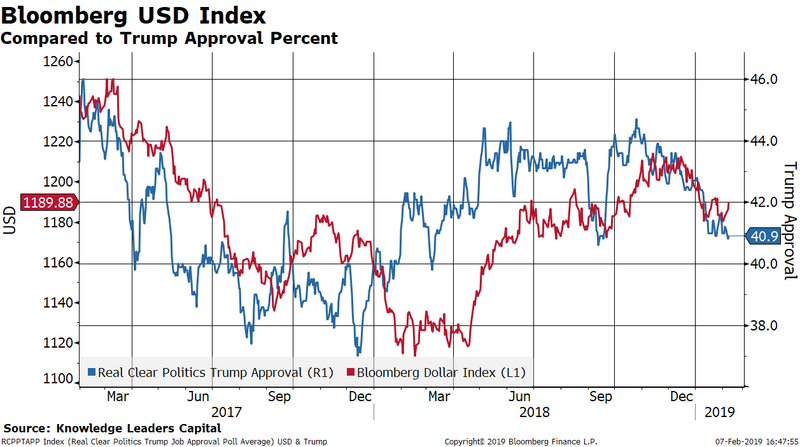 In 2017, before ramping up the fight with China and Congress over the border wall, Trump’s approval sank alongside the USD. In 2018, as the trade war crystallized, his approval rose, pulling the USD higher. Recently, I suspect the drop in stocks in the fourth quarter caused the 4 point drop in approval rating. Wikipedia defines Knightian uncertainty as, “…a lack of any quantifiable knowledge about some possible occurrence, as opposed to the presence of quantifiable risk. 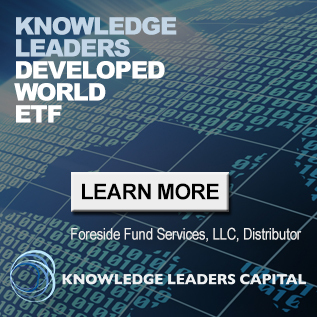 The concept acknowledges some fundamental degree of ignorance, a limit to knowledge, and an essential unpredictability of future events.” Well said!